Anne Loecher shines a floodlight on the obscure and all but forgotten midwest poet Lorine Niedecker whose life, poetry and poetics are a surprise to me: where you might least expect it (the periodically flooded Blackhawk Island, Wisconsin), a resolute soul emerges. I love her word “condensery” that describes the exact and terse language of her poems. I am exhilarated by the adventurousness that led her to blast out of Blackhawk Island to New York and the arms (and poetics) of Louis Zukofsky. But her subsequent abortion and the return to Blackhawk Island are sad to read about. The poems, forged in the fire, are extraordinary. Lorine Niedecker is, in the estimation of many prominent poets and scholars, a major poet. However, even today, 42 years after her death, Niedecker still is not widely read. In fact, she has been called “the world’s greatest unknown poet.” Only recently has her work begun to attract an expanding readership—which is still modest at best. As with other examples of under-read or forgotten poets, this oversight sparks the question of why—or why not—and begs an inquiry into the merits of Niedecker’s work, her times, our times, and the complexity of her poetics. Ironically, it is possible that Niedecker’s slow-growing readership owes much to the singularity and particularity of her poetics. That the relative smallness of her readership is attributable to a misperceived “smallness” of her poetics. For to follow the development of Niedecker’s poetics is to find its tracks and traces in silences, in smallnesses, in pauses and paucities. The voice of Niedecker that evolved and emerged is not an obvious one; its presence can be detected in reflections; the reflections in the omnipresent waters surrounding and often consuming the environs where she lived, in rivers and flood waters and lakes of her small Wisconsin town and the Upper Midwest. Her poetics can be followed in the nearly invisible traces of minerals these waters carried to the sea, and in the glacial progress of natural history and evolution – so quietly slow as to be barely discernible. To find Niedecker’s influence and legacy in such places is to realize that a clamoring, obstreperous appreciation would be implausible—and inappropriate. As the poet and scholar Rachel Blau DuPlessis has noted, Niedecker “was published only by small presses. She is barely anthologized. She made no ‘literary career.’” Having spent her life in rural isolation, far from the urban meccas of poetry and the publishing world’s male-dominated precincts, Lorine Niedecker’s poetry emerged in relative isolation. Additionally, in her lifetime, much of her poetry was radical—if subtly and cunningly so. Niedecker’s feminism was decades ahead of its time, and likely fell on deaf ears, often. The same could be said for her deftly wielded lines decrying other social injustices, her criticism of consumerism and other embedded aspects of mid-twentieth-century American life and culture. Some couldn’t see or hear her for her subtleties; some who could preferred not to look or listen too closely. Lorine Niedecker was born in 1903 in the tiny and insular community of Blackhawk Island , near the town of Fort Atkinson in rural Wisconsin. She lived in this area nearly all her life, with a few brief periods in New York and Milwaukee. of the woman moored to this low shore by deafness. and all I planted for the eye. I’ve wasted my whole life in water. My man’s got nothing but leaky boats. My daughter, writer, sits and floats. The poem honors, in a distant way, the memory of Niedecker’s mother, who was deaf and essentially abandoned by her husband during his lengthy affair with a neighbor. “Well”—the first word in the poem, serves as both a reference to the wellspring that feeds the homestead and the frequent floods, nurturing the family and devastating it at the same time. The mother is moored to the low shore, which suggests a constant threat of drowning—not only the possibility of drowning in the water, but the repeated drowning in the drudgery of her daily work, pumping the water out of her flooded home, washing the clothes which the silt keeps soaking and reclaiming. Beauty without practicality is dismissed, as if a ridiculous and indulgent luxury—as the lilacs the speaker’s mother planted are taken away by the constant, leaching waters. Ultimately, even what is necessary to life is leached away, as the “good black dirt” needed for crop growing, indeed the very land they stand on, is erased by wind and water in this constant fluid extraction and reclamation. Niedecker breaks in with her own voice in the short second stanza—a daughter’s distant though observant note that her mother is perhaps even freakish in her isolation. Her deafness is imagined as a blindness, too, and the image presented is of a creature inhabiting this solitary place, not quite human in appearance, but with “big blind ears” like a rabbit and with an elaborate head of hair. Her mother is like an island, cut off by her deafness, cut away from the land that is washing out from under her, separated from the simple enjoyment of beauty with the disappearance of the lilacs. In the mundus of Niedecker, deafness and blindness have a profoundly adverse meaning. They are not only the inability to see, hear—but also to perceive, to be aware, to be sensitive and attendant to. In short, the mother is cut off from life. When we arrive at the final stanza, the mother again speaking, we have an astonishing and utterly unembellished image of the mother, washing away, almost dissolving into a liquid existence, nothing stable, nothing solid. Even the boats her husband may have provided, as he provided little or no comfort or love, these boats are leaking and doomed to rot and sink. Only Lorine has found a way to float. Her writing may even suggest a sitting on water, or at least a manner of finding some ground and grounding; her floating—that is, her writing—is her survival. Love is a luxury, as disparate from the lives of those in the poem as if it were fantasy; it is not part of the fabric of these lives. If there is any beauty that survives, it is to be found in the dissolved particles in the flood waters. Niedecker’s first collection, New Goose, also has been suggested in some circles as the source of criticism that has mistakenly marked the poet as concerned with only small or low subject matter, with trivialities that are not the subject matter of major poets. That narrow view, attributable largely, one thinks, to the male-dominated poetry world of mid-century America, and its cultural prejudices—refers to Niedecker’s revisiting of the Mother Goose rhymes in this volume. Even a quick read reveals the size and girth of the work, which is anything but the small, cloying and miniaturish. “New Goose” speaks clearly to the cause of the betrayed laborers of the Depression era, whom Niedecker watched fail and starve – the farmers, who feed and nurture us, and who are all but invisible to those they feed. If feeding and nurturing is women’s work, she asks us to consider the men who have given their lives to it only to have their labors lost, shunned, and devalued. The link to women’s work is subtlety present: the diminishment, devaluation and erasure of the work of raising living things on this earth. Again, Niedecker is asking us to look more closely, to see the small, the unseen and unheard. Twelve hundred women and boys hopped. Duplessis also comments on Niedecker’s “…unexpected turns and word choices…(expressing) surprise found in the small, the trivial, the barely noticed.” To Duplessis, this was Niedecker’s carefully plotted strategy for entering the canon under the name “Anon,” alongside the numerous and century-spanning works that are unattributed but not unimportant. The New Goose collection specifically seeks to enter and reconsider this anonymous landscape, first in terms of the nursery rhyme’s ineradicable place in culture, folk culture; asserting folk culture’s importance and endurance in American culture, and also, an important assertion of the female, the Mother figure in Mother Goose, who has survived, reemerged and re-arisen in this first collection as a “New Goose.” A variant on the phoenix, if you will! These complex elements are those of a strong, assertive voice, and not a meek, resigning and retreating one. “Anon” is a potent potion. It is entirely possible, Duplessis believes, that this was not a mode of retreat into actual anonymity for Niedecker, but instead another facet of her poetics of silences, her visibility in reflections. In 1928, Niedecker married Frank Hartwig, who had been an employee of her father’s. She worked as a library assistant in the Fort Atkinson Public Library, where she was first exposed to the Imagist poets—Ezra Pound, H.D. and Amy Lowell. Niedecker published two poems that year, which demonstrated her interest in the Imagists. Two years later, in 1930 after the onset of the Great Depression, Niedecker and Hartwig lost their jobs and moved back to Blackhawk Island from their Fort Atkinson apartment, to live with Lorine’s parents. That same year, Lorine and Frank separated permanently, eventually divorcing. In 1931, Niedecker encountered the Objectivist movement in poetry, through the works of poet Louis Zukofsky she discovered in an issue of Poetry magazine. 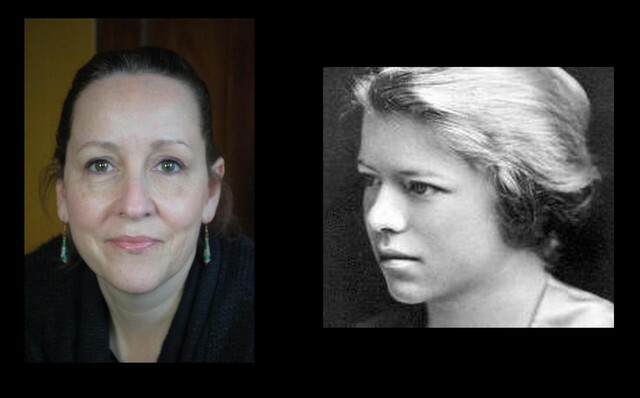 This was the start of Niedecker’s important and enduring relationship with Objectivism, and of her lengthy and complex personal relationship with Zukofsky. While Niedecker would often state that she felt a strong alignment with the Surrealist poets in addition to the Objectivists, she continues to be associated almost exclusively with the Objectivists. Zukofsky quickly became her mentor, and then her lover. Niedecker moved from Blackhawk Island to New York to be with him and soon afterward became pregnant by him. Zukofsky insisted she abort the twins she was carrying. She obeyed him in this, as she also did with his instructions to focus rigidly on Objectivism in her poetry. The abortion, which she did not want, was an immediate and lifelong regret, a profound and deeply affecting loss. Her long and strict adherence to Objectivist modes would become a source of regret somewhat later. However, as Niedecker scholar Jenny Penberthy has noted in her essay “A Little Too Little,” Niedecker may not be so easily defined. Objectivism appealed to Niedecker for its austerity, its lack of ornamentation, for its compression, its “extraordinary precision in (its) use of sound,” as the critic Peter Middleton describes for its lack of excess, to which Niedecker adhered throughout her ongoing poetic development. If Niedecker had a lesser commitment to Objectivism than is still widely believed, it is worth considering why she adhered to its methods and mandates to the extent she did. Rachel Blau DuPlessis in her essay “Sounding Process” sees Niedecker’s Objectivist allegiance partly owing to the power dynamic between Zukofsky as mentor and former lover, but also as an almost practical matter for Niedecker who may have—quite consciously—grasped what Objectivism could provide for her own, singular, developing poetics. That “…evoking objectivist practice gave Niedecker a frame for, a way of controlling, what she experienced as excess in herself…” The drive for concision, tightness and control was always in evidence. In her later poems, Niedecker merged the lack of sentimentality and excess, the “sincerity and force” she valued in Objectivism with the “muddle and floaty vagaries”that were her abstract and Surrealist interests as she wrote to Poetry magazine’s founder Harriet Monroe in 1933; a point she made again as late as 1968 in a letter to Clayton Eshleman, publisher of her late poems. Niedecker had a word for it: condensery. The pared down, elemental language, an emotional power driven by accuracy, precision, and lack of emotionalism or sentimentality. Adjectives and even articles are often omitted from Niedeckers’ short poems, the majority of which are untitled. Additionally, her lens focused on that “low” subject matter—the everyday, the quotidian. The rocks in the riverbed on the shores of Blackhawk Island, the stove, the wash bucket, the scrubbing of floors. How small all of this may seem: condensed language and form, modest scope and lack of the grandiose in style or subject, the frequent silences, the brevity, even the lack of titles—the quiet and small scale of her work have almost certainly played a role in the enduring quiet and smallness of her reputation. Scholar Elizabeth Wills, in the introduction of her book Radical Vernacular: Lorine Niedecker and the Poetics of Place, asserts that the perception of Niedecker as working in isolation ignores her constant written dialogues with other writers, as well as her dialogue with contemporary and historical persons and events, which her later poetry especially addresses in depth and often. Additionally, she argues that Niedecker’s physical isolation was not necessarily a disconnection or a desired hermeticsm or invisibility. Rather, it was an essential part of her methodology to study and consider her realm, in order to cultivate her poetic voice. It was essential to the intensification of her focus, her moving in ever closer to hear and see, and to write about the small scale with the greatest subtlety and nuance. DuPlessis writes of Niedecker: “She may seem to seek a minority, a littleness, a miniature scale almost unthinkable, especially for a female writer who can be culturally coded as minor no matter what genre she chooses, but especially if she chooses tiny-looking and folk forms.” The smallness, among other things, references Niedecker’s long fascination with haiku, another concise form. As the critic Jane Augustine writes in her essay on this poem, “Silence, intensified, becomes loud/brilliant.” We are given to consider Niedecker’s silences, her condensery, her miniaturism to have a perhaps very different intention than that of small scope, quaintness, or even regionalism. The discussion of Niedecker’s limited readership during her life must consider the context of sexual politics during her lifetime. Certainly, the power dynamics of her relationship with her mentor Zukofsky, an important gatekeeper to the greater literary world beyond Blackhawk Island, provokes debate. Niedecker’s subject matter of domestic work, not to mention her direct address of marriage, of brides as property, and her indictment of modern domesticity, connected to soulless consumerism and an amorality that enabled the Cold War—presents a strong feminist/humanist stance that undoubtedly played a role in the development of her powerful poetic voice, but likely kept a broader readership away. It is important to look closely at Niedecker’s strong reaction to the misogyny and sexism of her times. For when we examine the Niedecker poems that don’t just suggest this subject, but loudly assail it, we are hearing a railing against the social injustice of sexism and also, a deeply personal outcry that is her concern that she be read and heard as a poet; that she “float” and not drown in the larger literary landscape. If we look at this poem, while also taking into consideration Niedecker’s poems about her mother and the wearing and dissolving properties of water, we have a powerful indictment of sexism—of marriage, in fact—that Niedecker views as not dissimilar to the leaching waters of her physical environs. It is the voice of the silenced wife/bride/female/daughter that has gone unheard, that Niedecker asks us to lean in close to hear. The quieted, suppressed and submerged are speaking in Niedecker’s radically feminist works. The speaker has been able to survive, to ‘rise from’ the drowning landscape of mud and algae, and in this naturalized though sodden and possibly nearly-drowned state, casts an eye on the fate of one assumed to be more fortunate than the speaker—the woman chosen by a man to be a bride. The speaker has a view into the local church, in which “rich silence” ironically, as we understand Niedecker’s lexicon, indicates a silencing, a loss of voice and lost hope for posterity. Additionally, “rich” is circumspect, and also intended ironically here. The bride’s “diamond fronds” both suggest an overly elaborate, dubious decoration, as well as an “unnaturalized” nature. Can the embellishment of diamonds make fronds more beautiful, more worthy, or more valuable? Given the tone of the speaker’s voice, we think not. The church, rather than a place of purity—as would be befitting a wedding, if the wedding were indeed holy and pure—is insted a place where “satin secret collects.” This unembellished image is vivid, though strikingly simple, and its subtext is absolutely clear: the satin, suggesting the fabric of bride’s dresses and clergy’s vestments, is in fact sullied with some suspicious residue, which collects, secretly, perhaps in its folds, therefore not immediately visible or obvious. All the more pernicious for being hidden. What is hidden is not invisible; what is hidden, implicit but still present, is important. We must listen in closely to what is nearly inaudible beneath the silences. The poem’s final two lines equate the bride’s new marriage to a life sentence—though, with dark humor, Niedecker links the ‘serving’ of that sentence with the silver service, that common nuptial gift. The effect of the dark humor is to escalate the sting, the rage, the burn of the indictment. A bride is a “white slave-girl” which is to invoke her sexual servitude as well. A bride in her jeweled whiteness in the supposed sanctuary of a church is far less fortunate than the mud-soaked and nearly drowned speaker. At least the speaker retains her nature; she is poor and wretched, but no slave. She will “float” where the bride will certainly sink…as Niedecker’s mother did. ……….“Don’t let my head drop to the earth. I’m blind and deaf.” Death from the heart. ……….a thimble in her purse. The mother, blind and deaf, is recognizable as Lorine’s own mother, debilitated not only by physical handicaps but also by marriage, loneliness and abandonment. She fears she will die suddenly and soon, from loss of love and loneliness. The thimble in her purse recalls a human heart in her chest; however this “heart” is slim, hollow, metallic, a meager domestic scrap to fend off piercing needles and pins. The mother needs floors; previously, Niedecker depicted the washing away of floors in the floods, resulting in a bottomlessness, a rootlessness, a constant risk of drowning. The mother’s admonishment to Lorine is not to avoid marriage but instead to tend to her floors, her chores, weeds… those things that are washed until worn thin, and the weeds that overtake the beauty of the carefully planted flowers in her garden. That her mother would offer these words as survival tactics for her daughter, depicts the near impossibility of escape from this life, these lives, one generation after another, of despair, of being washed away and flushed out. In addition to Mary’s almost invisible stature as compared to her husband’s, she is aligned with the Virgin Mary, riding a donkey, and in a devastating and ugly turn, is so poorly regarded that once the donkey tires, it is Mary who must carry it. Presumably Percy is comfortably astride some grand horse. If the author of Frankenstein is so meanly treated by posterity, what might Niedecker expect for herself? Decades ahead of Betty Friedan and Gloria Steinem, Niedecker’s feminism arose from the enforced silencing of women writers before her—including those who, unlike Mary Shelley, were silenced finally. Niedecker’s feminism finds its place as asserting a voice and visibility for the unseen and unheard women of her age, place and culture. This synthesis of two modes, Objectivism and Surrealism, which were utterly incompatible in the eyes of Zukofsky, was to become Niedecker’s entry into her own reflective/reflectionist poetics—“a fusion of objectivist and surrealist tendencies,” as DuPlessis describes it. We begin to see emergences, as Niedecker removes from, or expands upon, strict Objectivist tenets, incorporating the environment, an anti-consumerist stance, a continuing respect for the laborer which emerges with increasing force in themes of social justice in her work, the many voiceless and unseen to which she gives voice and visibility. The final three lines, can be read, like most all of Niedecker’s lines, in multiple ways. The face no longer exists, because it has been washed away. The face no longer exists, because we are reading this poem after Niedecker’s passing. The face no longer exists in water; it is no longer reflected in water because the corporeal self passes. In water we cannot fish—we cannot fish after we have passed. In water, we cannot fish; once we are of the water, we can no longer fish. The poem also references Niedecker’s attendance to the great importance of the small and the small scale, as it is the contemplation of the fish, even the human face, that leads to the consideration of the great and the profound, much as the small rivers lead out into the ocean. The corporeal self is immersed, subsumed and ultimately dissolves out into the greater corpus of life force and being. Following a further distancing from Zukofsky in the early 1960’s, attributed to “increasing tensions between them concerning power and career.” Niedecker began defining her poetics in terms that included but reached further and further beyond the strict confines of Objectivism. In 1967, she wrote “Much taken up with how to define a way of writing poetry which is not Imagist nor Objectivist fundamentally nor Surrealism alone. ..I loosely call it ‘reflections’… reflective. .. The basis is direct and clear – what has been seen or heard – but something gets in, overlays all that to make a state of consciousness… The visual form is there in the background and the words convey what the visual form gives off after it’s felt in the mind… And (there is) awareness of everything influencing everything…” This Reflectivism clearly necessitates the closest possible observation to even the smallest details. When we look at Niedecker’s late, long poem, “Paen to Place,” we can identify the emergence of Reflectivism. Niedecker could not have issued a more potent comment about the place of verse in her life. She becomes knowable upon reflection; she becomes visible in reflections of her physical self. After Niedecker married Al Millen, a housepainter and sometime resident of Blackhawk Island (a marriage which was a curiosity to writer friends as Millen was not a reader of poetry and appeared to share few of her interests), the couple set out on extended trips throughout the upper Midwest. From the poem’s opening, all earliest, most ancient and most enduring elements are linked, whether they remain in their natural and unaltered state by the lake, or have been forged by human hands, to create trains, for example from iron. This is Niedecker moving forward in a continuing progression to bring the entirety of natural and human history into a cogent whole. Within the poem’s body, Niedecker goes on to address such historical events, pertinent to the immediate landscape, as the explorations of Marquette and Joliet, and the lives of the Native Americans who inhabited this same land. Niedecker referred to Lake Superior as the “true source park.” Thus, herein are linked the earliest inhabitants of the land, with the rocks and minerals and also the prehistoric glacial changes that resulted in land thrust up and scoured rocks. Water rushes and moves through all of these; the glaciers, frozen water, created this landscape and the rest of the earth; all that is the home to all life. This marks a dramatic expansion of her vision and poetics: she has broadened her scope, in one sense, to explore the smallnesses in the most enormous—in terms of both place and time. In “Darwin,” Niedecker braids all natural and human history, even the question of creation, “the working of chance” and allowing for “each man (to) hope/ and believe/ what he can.’” Water gives rise to life, and seashells appear on mountain tops as the earth evolves across the billions of years. Glaciers evolve into sea water, sea plants secrete digestive juices that link them to mammals. Even the lack of punctuation, the absence of any periods at the end of stanzas or at the end of the poem points to this: all is connected; all is of the continuum. Niedecker died at the age of 67 on December 31, 1970. She requested that her husband Al Millen burn all of her letters. The letters written by her to others survive. Niedecker, in her close observations, explored the spaces and the pauses, the connections and possibilities between lines and sounds, and what was revealed in the reflections in the water. Niedecker’s vision and poetics encircles, embraces and celebrates the small and the minute, the nearly invisible who and which, under her artful scrutiny, are proven to be the essential carriers of the enduring life force, gigantic in their purpose. She is deserving of an audience capable of seeing the enormities within her smallnesses—which is not to say a small audience. Anne Loecher is a former Madison Avenue Creative Director, now working in nonprofit communications. Having recently earned her MFA in poetry from the Vermont College of Fine Arts, she is working on her poetry manuscript, as well as her first screenplay. She lives Vermont with her husband, teenage daughter, dog and cat. Her most recent contribution to Numéro Cinq is an interview with the poet Donald Hall.